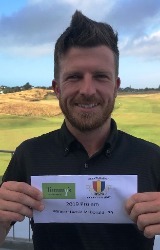 Marton Professional Lachie McDonald battled the ferocious conditions to win the Tommys Kapiti Paraparaumu Beach Pro-am. The strong winds blew throughout the day and at times the course was on the brink of being declared unplayable. The professional field was one of the strongest ever for the event and of the 42 who played Lachie was the only player to break par. He mixed four bogies with five birdies which included a birdie, birdie finish for his one under 70. The well performed Kieran Muir was second on 71 and in third place on 72 was Jordan Loof who turned professional in January.